How are we to distinguish between the essential and accidental properties of things such as individual people, cats, trees, and tables? Almost everyone agrees that such individuals could have been different, in certain respects, from the way that they actually are. But what are the respects in which they could not have been different: which of their properties are essential to their being the individuals that they are? And why? Following the revival of interest among analytic philosophers in essentialism and de re modality generated by the work of Kripke and others in the 1970s, these questions have been the subject of intense, yet still unresolved, debate. 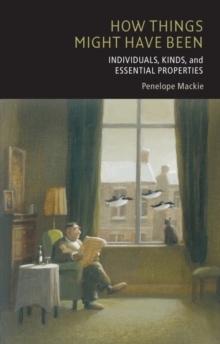 In this book, Penelope Mackie challenges most of the answers that have been given to these questions. Via a critical examination of rival theories, she arrives at what she calls 'minimalist essentialism', an unorthodox theory according to which ordinary individualshave relatively few interesting essential properties, and intuitions that appear to support stronger versions of essentialism are interpreted as consistent with the theory. The topics discussed include the rivalry between the interpretation of de re modality in terms of 'identity across possible worlds' and its interpretation in terms of David Lewis's counterpart theory, some notorious modal puzzles generated by the theory that individuals exist with different properties in different possible worlds, the notion of an individual essence, Kripke's 'necessity of origin' thesis, and the widely held view that there are sortal properties that are essential properties ofthe things to which they belong. The book also includes a discussion of the relation between essentialism about individuals and essentialism about natural kinds, and a critical examination of the connection between semantics and natural kind essentialism.